Este es un video breve sobre el uso del remedio “Clear Metal” [Aclarar Metal], de los Tres Tesoros, que se usa para invasiones agudas de Viento-Calor. Las invasiones de Viento-Calor pueden ser de dos tipos: puede ser lo que yo llamo una invasión “simple” de Viento-Calor, o puede ser una invasión de Viento-Calor del tipo Wen Bing. Por ejemplo: una mononucleosis aguda sería una invasión de Viento-Calor del tipo Wen Bing. El remedio “Clear Metal” puede usarse para ambos tipos de invasiones. Ya sea que la invasión de Viento-Calor sea o no del tipo Wen Bing, siempre hago un diagnóstico sobre la base de la teoría de los “4 niveles”: Wei, Qi, Ying y Xue. Pienso que la teoría de los 4 niveles es absolutamente esencial para el diagnóstico y tratamiento de las invasiones agudas de Viento-Calor. En el nivel Wei, el Viento-Calor está en el exterior. El nivel Wei se caracteriza por una aversión simultánea al frío y fiebre. Es decir, observas al paciente, quizá es un niño en cama, tiene fiebre y su frente está muy caliente, pero el niño siente frío. Esta es la sintomatología clásica del estado agudo de una invasión de Viento-Calor, que sería en el nivel Wei, de los 4 niveles. “Clear “Metal” NO es para el nivel Wei. Repito: No es para el nivel Wei. En el nivel Qi, el Calor ha penetrado al interior, y la principal diferencia es que el paciente ya no tiene aversión al frío. Ya no siente frío, sino calor. Está el niño en cama, vas a revisar al niño, y notas que el niño está sudando, y se ha quitado de encima los cobertores. Esto significa que el Calor ha penetrado al siguiente nivel, es decir, al nivel Qi, en el que el paciente aún tiene fiebre, pero se siente caliente y tiene sed, posiblemente está sudando, y, generalmente, en este nivel Qi, el Calor está en los Pulmones. De manera que hay, ya sea Calor en Pulmón, o Flema-Calor en Pulmón, y, entonces, habría tos, con o sin expectoración. El remedio “Clear Metal” es para este nivel, para Calor en el nivel Qi, que sería la segunda etapa de una invasión de Viento-Calor. Otra característica de las invasiones de Viento-Calor, especialmente las del tipo Wen Bing, es que progresan rápidamente. De manera que tenemos que ver al paciente más de una vez al día, porque debemos cambiar el tratamiento tan pronto como el factor patógeno pasa del nivel Wei al nivel Qi, lo cual se caracteriza, repito, por el hecho de que el paciente ya no siente frío, sino que siente calor. Cuando esto sucede, podemos usar “Clear Metal”, especialmente si el Calor es pronunciado. 9 tabletas al día. Si el paciente tiene síntomas claros de Flema-Calor en Pulmón, o sea Calor en Pulmón con Flema, entonces el remedio a usarse, más que “Clear Metal”, sería “Ringing Metal” [Resonando el Metal]. Estos dos remedios son similares en el sentido de que tratan el nivel Qi, pero “Clear Metal” es mejor si el Calor es pronunciado: el paciente tiene mucho calor, tiene sed y sequedad en la boca. Si el paciente tiene tos con expectoración de mucosidad, entonces podemos usar el remedio de “Ringing Metal”. En resumen, estos dos remedios son similares, en el sentido de que ambos tratan el nivel Qi, pero “Clear Metal” es especialmente mejor si el Calor es pronunciado, y “Ringing Metal” es mejor si hay Flema-Calor en los Pulmones. Por cierto, otra razón para usar “Clear Metal” es que, si el Calor es pronunciado, también podría progresar hacia el siguiente nivel, es decir, al nivel Ying, la cual sería una progresión mala, porque, potencialmente, podría haber repercusiones serias en el nivel Ying o en el nivel Xue. Así que es muy importante tratar el Calor en el nivel Qi, y detenerlo en el nivel Qi, con el uso de “Clear Metal”. Chapter 81 of the Su Wen has an interesting view of sadness and tears. 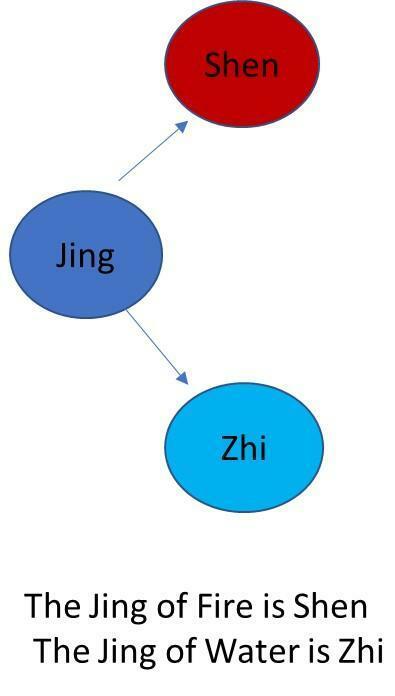 The Jing of Water is Zhi and the Jing of Fire is Shen. The interaction of Water and Fire causes sadness of both the Zhi and the Shen and that is why tears run out of the eyes. Zhang Jie Bin (also called Zhang Jing Yue) commenting on this chapter says: "In case of sadness Shen Qi is transmitted to the Heart. When it is transmitted to the Heart the Jing is not transmitted downwards to the Zhi, the Jing collects above and Zhi is depleted below. 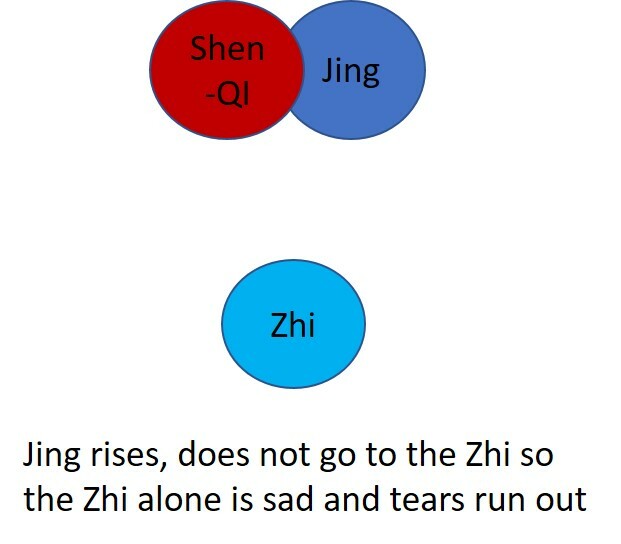 As a result the Zhi alone generates sadness and the Jing has nothing to control. Hence the Water is not stored below and the tears appear above." This passage from the Su Wen highlights several interesting points. The first is the view that both Fire and Water (and therefore Heart and Kidneys) are transformations of Jing. The second is that both Heart and Kidneys influence the eyes (and not just the Liver as we would think according to the 5-Element correspondences). The other very interesting view is that the emotion of sadness is related to Heart and Kidneys and not just the Lungs as we would think according to the 5-Element correspondences. The fourth point highlighted by this chapter is that tears are a fluid derived from the Kidneys. Interestingly, my teacher Dr. Shen used to say that, when a person is very sad but does not cry, fluids do not come out in the form of tears and this may injure the Kidneys. Sadness of the Heart and Kidneys: Ren-15 Jiuwei, HE-7 Shenmen, KI-9 Zhubin, Ren-4 Guanyuan. 1. 1979 The Yellow Emperor's Classic of Internal Medicine-Simple Questions (Huang Ti Nei Jing Su Wen). 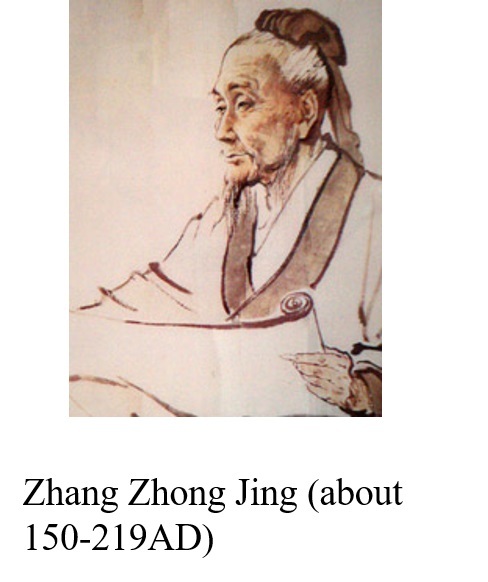 People's Health Publishing House, Beijing, first published c. 100 BC, p. 571. 2. Ibid. p. 22, 31, 70. 3. 1981 Spiritual Axis (Ling Shu Jing灵枢经), People=s Health Publishing House, Beijing. First published c. 100 BC., p. 49. I have been consulting the Nei Jing for 35 years initially in its French translation (by Chamfrault) and later in Chinese. As we all know, the Nei Jing is a mine of information and most of the things we do in practice are in this text. It should be stressed that the Nei Jing was written by many different doctors and edited several times notably during the Song dynasty. For this reason besides containing all the familiar theories, the Nei Jing also has many passages that present unusual theories. This clinical tip and subsequent ones will discuss the more unusual aspects of the Nei Jing, the first one being about the Heart. As we know from diagnosis the lustre of the eyes is a very important manifestation of the state of the Shen. Eyes with lustre indicate a good state of the Shen while dull, lustreless eyes indicate long-standing emotional problems. Apart from the eyes being the orifice of the Heart from a Shen perspective, the Heart also influences the eyes on a physical level. Chapter 11 of the Ling Shu describes the pathways of the Divergent channels and the Heart Divergent channel goes to the inner corner of the eyes. A redness in the inner corner of the eyes often indicates Heart-Fire and not necessarily Liver-Fire as we may be inclined to conclude (given the close relationship between Liver and eyes). Another connection between the Heart and eyes is that the Heart Luo channel goes to the eyes. To treat eye problems related to the Heart such as redness or blood-shot eyes especially in the inner corner the best point is HE-5 Tongli; if there is Heart Fire I would add HE-8 Shaofu. In case of nasal obstruction related to the Heart I would use HE-9 Shaochong. This is an interesting statement because it relates the Root of Life both to the Kidneys (because they store Jing) and the Heart because it houses the Shen. This highlights the important connection between Fire and Water and between Heart and Kidneys. In other words our constitution depends not only on the Jing of the Kidneys but also on the Shen of the Heart. In order to influence the Root of Life of the Heart I would use HE-7 Shenmen and Ren-15 Jiuwei. Generally, ear problems such as deafness or tinnitus are related to the Kidneys. However such problems maybe related to the Heart especially when there is a deficiency in the Upper Burner with Heart-Qi not rising to the head. We would know this from the pulse being weak in both cun positions. To treat this type of ear problem related to the Heart I would use HE-5 Tongli. 1. 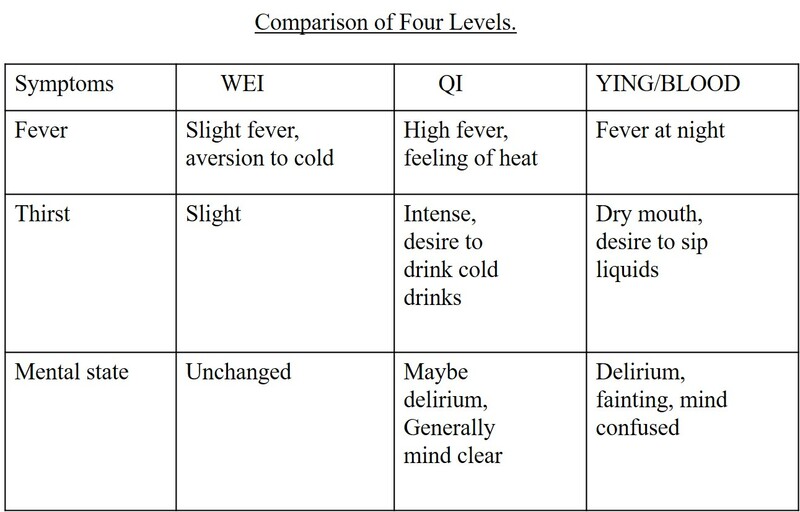 1979 The Yellow Emperor’s Classic of Internal Medicine-Simple Questions (Huang Ti Nei Jing Su Wen). 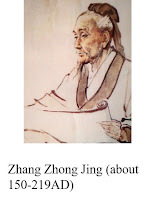 People’s Health Publishing House, Beijing, first published c. 100 BC, p. 571. There are three types of influenza virus, A, B and C. Influenza A viruses are found in humans and animals, whereas B and C are found only in human beings. Infection with influenza produces an immune response with the production of antibodies in the blood which neutralize the virus. If the person encounters the same influenza virus again while the antibodies are still present, the body is protected and the person should not develop the infection. It is a characteristic of influenza viruses, and especially of the A virus, that they frequently mutate into sub-types so that the virus is “one step ahead” of the natural immunity created by the body. It is usually when sub-types develop that epidemics occur because the antibodies produced will not protect individuals against an influenza virus in which the surface proteins have undergone a significant change since the previous infection. An example of a new subtype a few years ago was the H5N1 “avian influenza” virus, first isolated in Hong Kong in May 1997, which previously had only been found in birds and was not associated with disease in humans. The latest example of a sub-type is the H1N1 virus responsible for the so-called “swine flu”. Influenza viruses spread from person to person by tiny droplets produced by coughing and sneezing. The initial site of infection is the lining of the respiratory tract, and the infection has a short incubation period of up to five days. The virus is shed in respiratory secretions starting about one day before the onset of the illness and lasting for about three to five days. The classic symptoms of influenza include fever, malaise, headache, aches and pains in the muscles and joints, and a characteristic dry cough and sore throat. The acute illness usually lasts for three to five days but recovery may be slow, and cough and tiredness may persist for two to four weeks post infection. Complications may occur in groups of patients who are particularly at risk (e.g. those with underlying lung disease or those with defective immune systems), and usually affect the lungs and the heart. Upper and lower respiratory tract infections are common and subsequent invasion of the lungs by bacteria may result in the development of pneumonia. Influenza cannot be diagnosed and treated properly without a thorough understanding of the theory of the 6 Stages but particularly that of the 4 Levels. The beginning stages of an acute respiratory infection usually manifest with symptoms of invasions of exterior Wind. 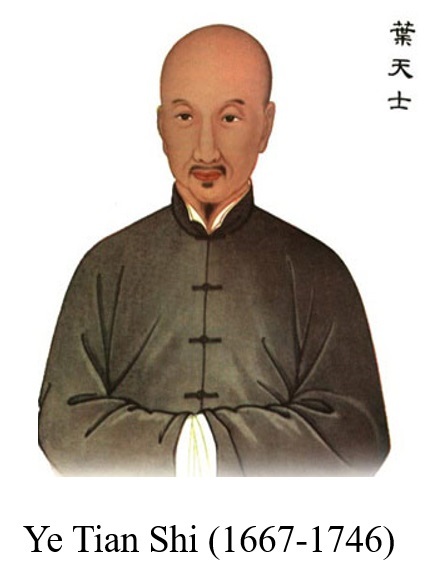 The “Shang Han Lun” by Zhang Zhong Jing (c. AD 220) provided the earliest framework for the diagnosis and treatment of diseases from exterior Wind-Cold. 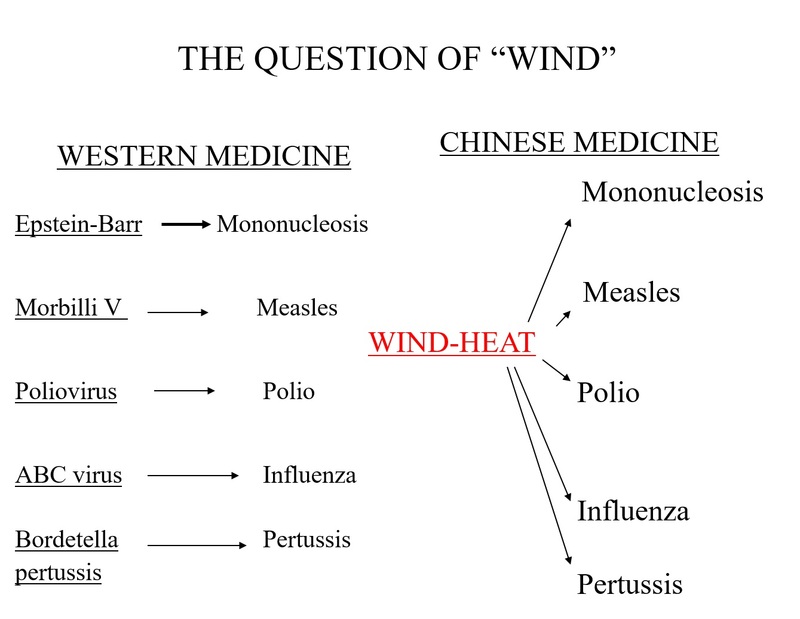 Although this classic does also discuss invasions of Wind-Heat and their treatment, a comprehensive theory of exterior diseases from Wind-Heat was not developed until the late 1600s by the School of Warm Diseases (Wen Bing). 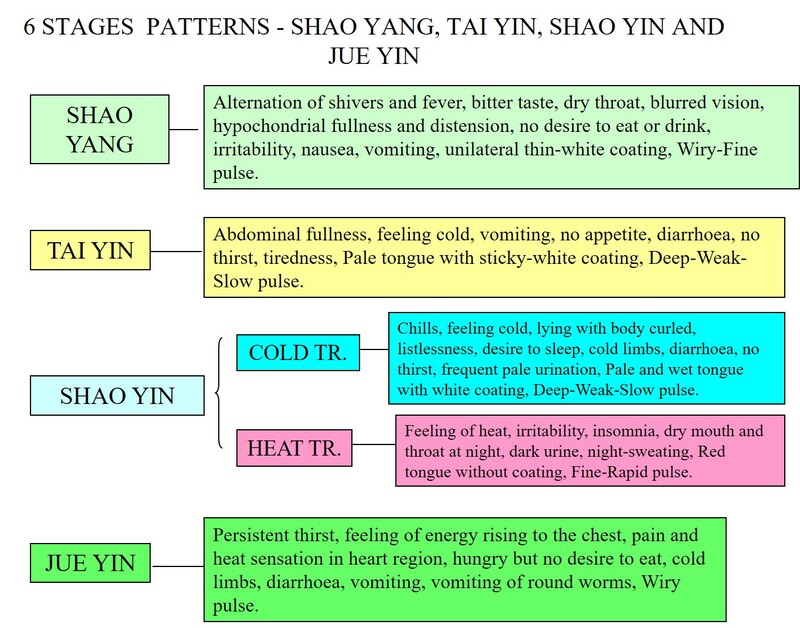 Thus, the two schools of thought which form the pillars for the diagnosis and treatment of exterior diseases in Chinese medicine are separated by about 15 centuries: they are the School of Cold-induced Diseases (School of Shang Han) based on the “Discussion of Cold-induced Diseases” (“Shang Han Lun”) by Zhang Zhong Jing and the School of Warm Diseases (Wen Bing School) which started in the late 1600s and early 1700s. 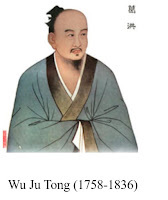 The main advocates of this school were Wu You Ke (1582-1652), Ye Tian Shi (1667-1746) and Wu Ju Tong (1758-1836). 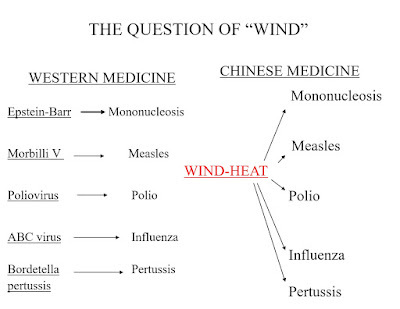 While in Western medicine every external infectious disease is differentiated according to the pathogenic virus or bacteria, in Chinese medicine, they area ll caused by Wind-Heat. Why does Chinese medicine attribute such importance to external diseases from Wind? The Su Wen says that Wind may be the cause of "100 diseases". I have listed below the main reason why we should pay close attention to diseases from exterior Wind. Latent Heat is cause of serious, modern diseases, e.g. AIDS, leukaemia, auto-immune diseases. 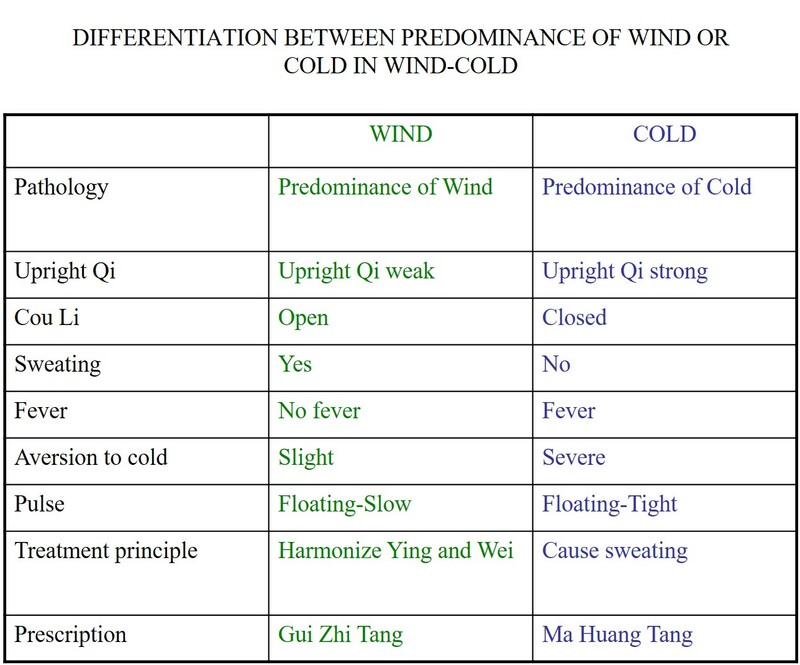 The symptomatology of Wind-Cold was discussed by Zhang Zhong Jing in the “Discussion of Cold-induced Diseases” (c. AD 220) where he first elaborated the theory of the 6 Stages. The first stage, Tai Yang, is the only Exterior one. 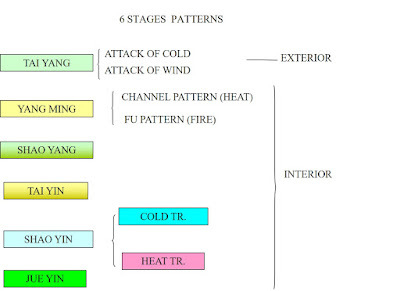 At this stage Wind-Cold is on the Exterior and only the Lung's Wei Qi portion is affected, not the Interior. 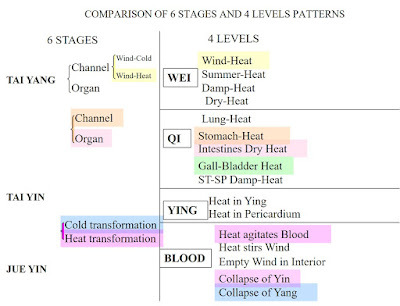 The Lung's diffusing and descending of Qi is impaired and the external Wind is lodged in the space between skin and muscles impairing the circulation of Wei Qi. “Aversion to cold” indicates the typical cold feeling and shivering which comes on as a wave in the beginning stages of a cold or influenza. It is characteristic in so far as it is not relieved by covering oneself. Most people who experience a bad cold or flu shiver even in bed under the blankets. The occipital headache or stiffness is due to the obstruction of Wei Qi circulation in the Tai-Yang channels (Small Intestine and Bladder) which flow in that area. The Floating pulse reflects the rushing of Wei Qi towards the Exterior to fight the pathogenic factor. Besides these three cardinal symptoms there are many others such as a runny nose, sneezing, possibly a fever, a cough, body aches, itchy throat, etc. 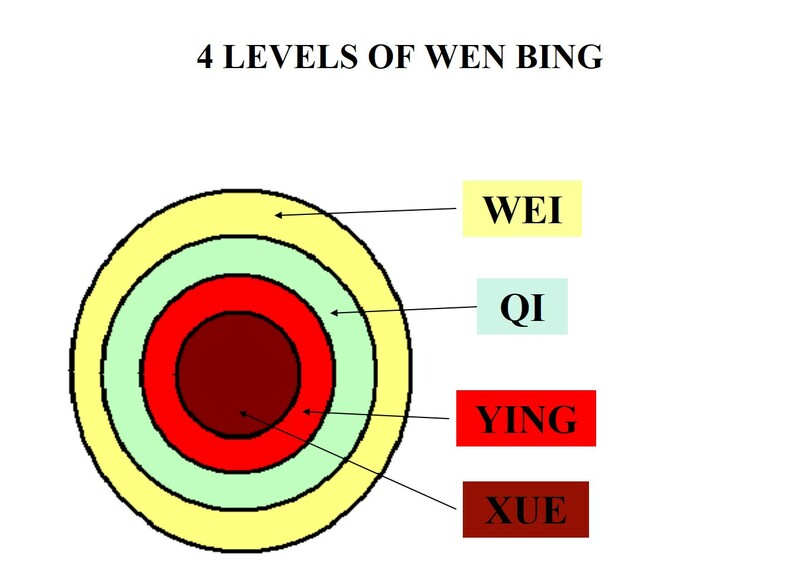 All these are due to the impairment of the diffusing and descending of Qi by the Lungs and by the obstruction to the circulation of Wei Qi in the muscles. In particular, the aversion to cold occurs simultaneously with “emission of heat” (fa re), i.e. the patient’s body emits heat and it feels hot to the touch: please note that the patient may or may not have an actual fever. Therefore “aversion to cold” is a subjective cold feeling of the patient while “fever” (or rather “emission of heat”) is an objective hot feeling of the patient’s body to the touch. 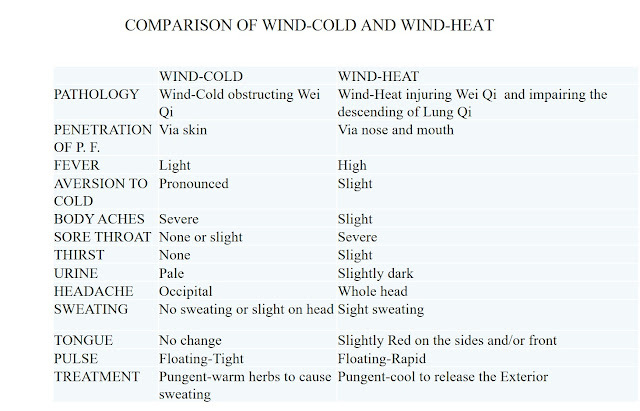 Aversion to cold is caused by the obstruction of the space between skin and muscles by exterior Wind: as the Wei Qi circulates in this space and warms the muscles, when it is obstructed by exterior Wind, the patient feels cold: remember, this can and does happen with Wind-Heat too. The emission of heat is an expression of the fight between the body’s Upright Qi and the exterior Wind. What does “Warm disease” mean? This is my own translation of the Chinese term Wen Bing. The above-mentioned doctors from this school of thought introduced important innovations to the theory of Wind in Chinese medicine. The School of Warm Diseases postulates that some exterior pathogenic factors go beyond the natural characters of “Wind”; they are so virulent and strong that, no matter how strong a person's body's Qi may be, men, women and children fall ill by the dozen. More importantly, for the first time in the history of Chinese medicine, these doctors recognized that some external pathogenic factors are infectious. 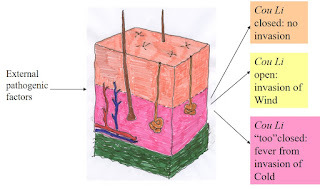 A further innovative idea stemming from this school was that the pathogenic factors causing Warm diseases, all of them falling under the category of Wind-Heat, enter via the nose and mouth, rather than via the skin as happens for Wind-Cold. 7) Once in the Interior, the Heat has a strong tendency to dry up body fluids. Thus, although all pathogenic factors contemplated by the School of Warm Diseases fall under the broad definition of Wind-Heat, not all diseases caused by Wind-Heat are Warm diseases. Some of the exterior diseases that start with symptoms of Wind-Heat are Warm diseases (with all the above-mentioned characteristics) and some are not. Examples of Warm diseases are influenza, measles, chicken-pox, German measles, poliomyelitis, smallpox, scarlet fever, whooping cough or meningitis. An influenza epidemic that sweeps the world is always a Wen Bing disease. This is because it is very virulent and has a strong tendency to enter the Qi level (causing chest infections) very quickly. Examples of Wind-Heat diseases which are not Warm diseases are common cold (of the Wind-Heat type), glandular fever (mononucleosis) and any non-specific upper-respiratory infection manifesting with symptoms of Wind-Heat. 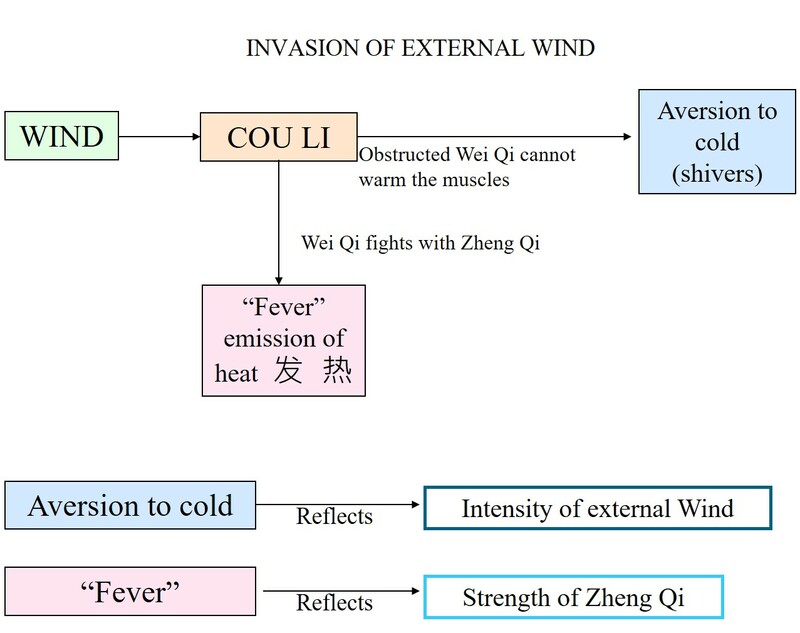 The distinction between “simple” invasions of Wind-Heat and invasions of Wind-Heat that are a Wen Bing disease is a very important consideration in practice: it is possible to stop diseases from “simple” Wind-Heat at the early stages, but although true Warm diseases may always be alleviated in the initial stages, they may not always be entirely stopped at the initial stages. The treatment of exterior invasions is important because they can have very serious consequences in children and the elderly. In children, many serious diseases start with symptoms of invasion of Wind-Heat: in the initial stages one does not know what disease it might be and it is therefore important to treat the manifestations early. For example, measles, diphtheria, whooping cough, poliomyelitis, acute nephritis, scarlet fever and meningitis may all manifest with symptoms of Wind-Heat in the beginning stage. In the elderly, exterior Wind may easily penetrate the Interior causing bronchitis and pneumonia which is often fatal in old age. 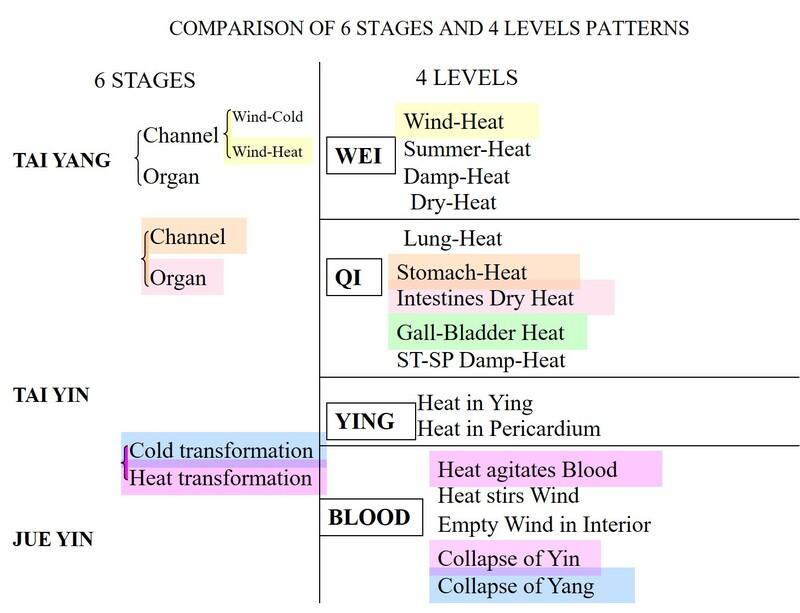 The Wei Level concerns the exterior stage of an invasion of Wind-Heat of the Wen Bing type, the other three Levels describe pathological conditions which arise when the pathogenic factor penetrates the Interior and turns into Heat. 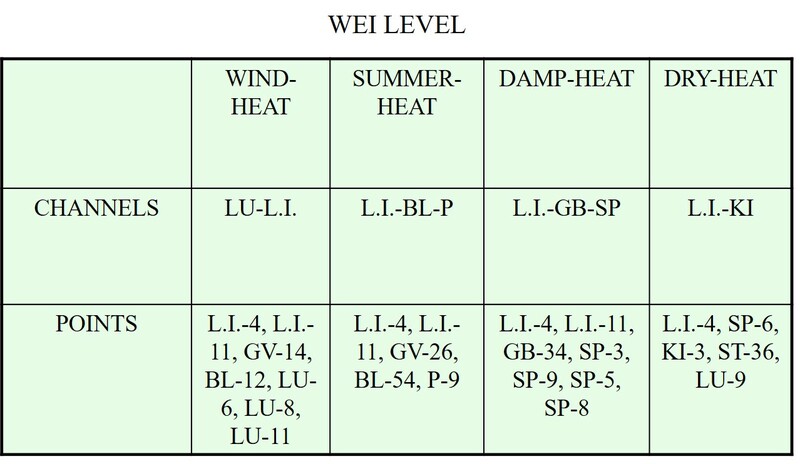 Although the theory of the 4 Levels arose in application to Wen Bing diseases, it can and should be applied also to any invasion of Wind-Heat, whether Wen Bing or not. The four Levels represent different levels of energetic depth, the first being the Exterior and the other three being the Interior. The interesting part of this theory is the distinction, within the Interior, of three different levels, the Qi Level being the most superficial (within the Interior) and the Blood Level the deepest. 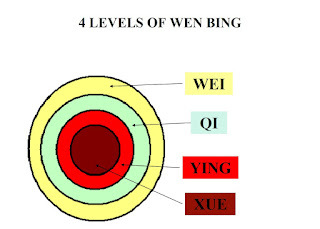 The Wei Level of the 4 Levels broadly corresponds to the Tai Yang Stage of the 6 Stages. The former deals with Wind-Heat and the latter with Wind-Cold. 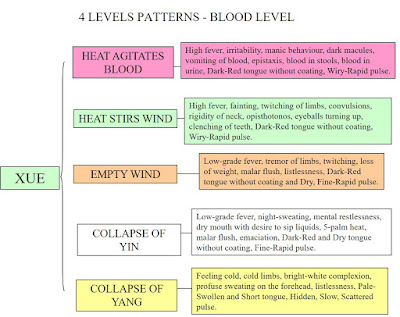 The main symptoms of invasion of Wind-Heat at the Wei Level are aversion to cold, shivering, fever, sore throat, swollen tonsils, headache and body-aches, sneezing, cough, runny nose with yellow discharge, slightly dark urine, slightly Red sides of the tongue and a Floating-Rapid pulse. 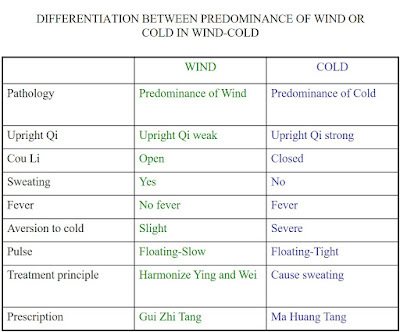 It is worth noting that in Wind-Heat too there is aversion to cold as this is due to Wind-Heat obstructing the Wei Qi which therefore fails to warm the muscles. An invasion of an exterior pathogenic factor is due to a temporary and relative imbalance between it and the body's Qi. This imbalance may occur either because the body's Qi is temporarily and relatively weak or because the pathogenic factor is very strong or both. The body's Qi may be temporarily and relatively weak due to overwork, excessive sexual activity, irregular diet and emotional stress or a combination of these. When the body is thus weakened, even a mild pathogenic factor may cause an external invasion of Wind. “Wind” indicates both an aetiological factor and a pathological condition. As an aetiological factor, it literally refers to climatic influences and especially sudden changes of weather to which the body cannot adapt. As a pathological condition, “Wind” refers to a complex of symptoms and signs manifesting as Wind-Cold or Wind-Heat. In clinical practice, this is the most important aspect of the concept of Wind. Thus, the diagnosis of “Wind” invasion is made not on the basis of the history (no need to ask the patient whether he or she has been exposed to wind), but on the basis of the symptoms and signs. If a person has all the symptoms and signs of “Wind” (aversion to cold, shivering, “fever”, sneezing, runny nose, headache and a Floating pulse), then the condition is one of exterior Wind, no matter what climate that person has been exposed to in the previous days or hours. Indeed, there are also chronic conditions which manifest with symptoms of “Wind” and are treated as such even though they have no relation to climatic factors. For example, allergic rhinitis (due to house-dust mites or pollen) manifests with symptoms and signs of “Wind” and is treated as such. Influenza manifests primarily with symptoms of Wind-Heat. 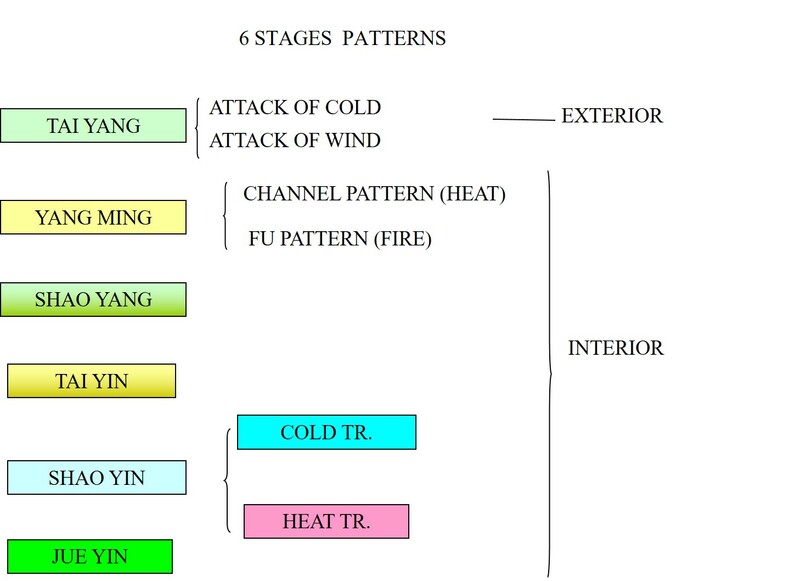 The simultaneous fever (or "emission of heat") and aversion to cold is the most characteristic symptom of the beginning stages of an invasion of Wind: they indicate that there is an invasion of an exterior pathogenic factor and that this factor is still at the Exterior level. As long as there is aversion to cold, the pathogenic factor is on the Exterior. I shall now discuss in detail the pathology and clinical significance of the "aversion to cold" and "fever" in the beginning stage of invasion of exterior Wind. 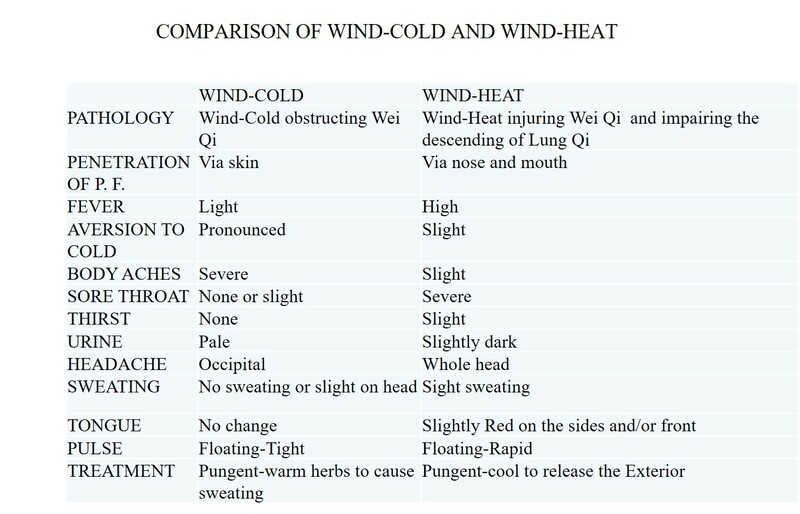 In Exterior patterns, the aversion to cold and cold feeling is due to the external Wind obstructing the space between skin and muscles where the Wei Qi circulates; as Wei Qi warms the muscles, its obstruction by Wind causes the patient to feel cold and shiver (even if the pathogenic factor is Wind-Heat). 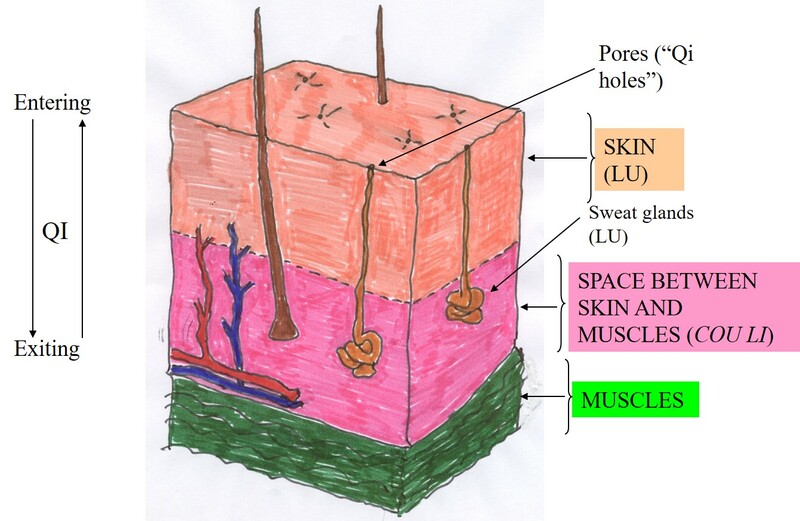 Thus, Wei Qi is not necessarily weak but only obstructed in the space between skin and muscles. Both Wind-Cold and Wind-Heat cause aversion to cold. 3) he or she is reluctant to go out and wants to stay indoors. Except in mild cases, the cold feeling is not relieved by covering oneself. In conclusion, a feeling of cold in exterior invasions is due to the obstruction of Wei Qi in the space between skin and muscles and it indicates that the pathogenic factor is on the Exterior: as soon as the feeling of cold goes, the pathogenic factor is in the Interior. As for "fever“, the Chinese terms fa shao or fa re do not necessarily indicate "fever". 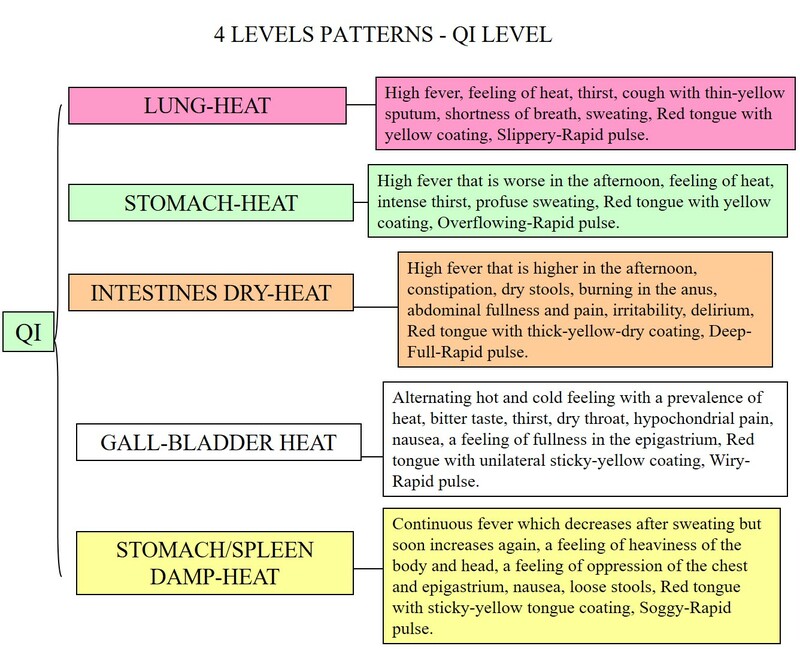 "Fever" is a sign in modern Western medicine, not in old Chinese medicine. 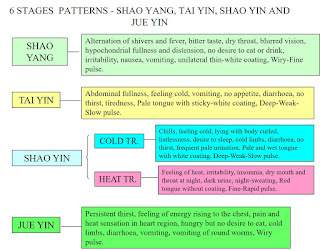 In old China, there were obviously no thermometers and the symptoms fa shao or fa re described in the old texts do not necessarily mean that the patient has an actual fever. It literally means "emitting heat" and it indicates that the patient's body feels hot, almost burning to the touch: the areas touched were the forehead and the dorsum of the hands (as opposed to the palms). In fact, it is a characteristic of fa re (so-called "fever") in the exterior stage of invasions of Wind that the dorsum of the hands feel hot compared to the palms and the upper back feels hot compared to the chest. This objective hot feeling of the patient's body may or may not be accompanied by an actual fever although in Wen Bing diseases it is. When the symptoms of shivers and feeling cold occurs simultaneously with the objective sign of the patient's body feeling hot to the touch (or having an actual fever), it indicates an acute invasion of external Wind and it denotes that the pathogenic factor is still on the Exterior. In particular, it is the symptoms of shivering and feeling cold that indicate that the pathogenic factor is on the Exterior: the moment the patient does not feel cold any longer but feels hot and, if in bed, he or she throws off the blankets, it means that the pathogenic factor is in the Interior and it has turned into Heat. 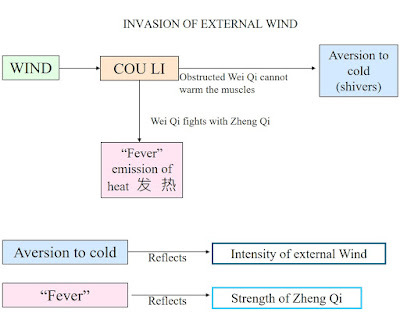 The "fever", or hot feeling of the body in external invasions of Wind is due to the struggle between the body's Qi (Zheng Qi) and the external pathogenic factor. 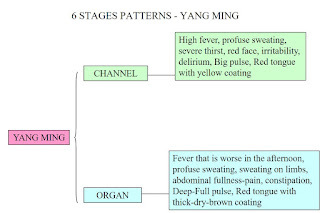 Thus, the strength of the fever (or hot feeling of the body) reflects the intensity of this struggle: this depends on the relative strength of the external pathogenic factor and the strength of the Zheng Qi. 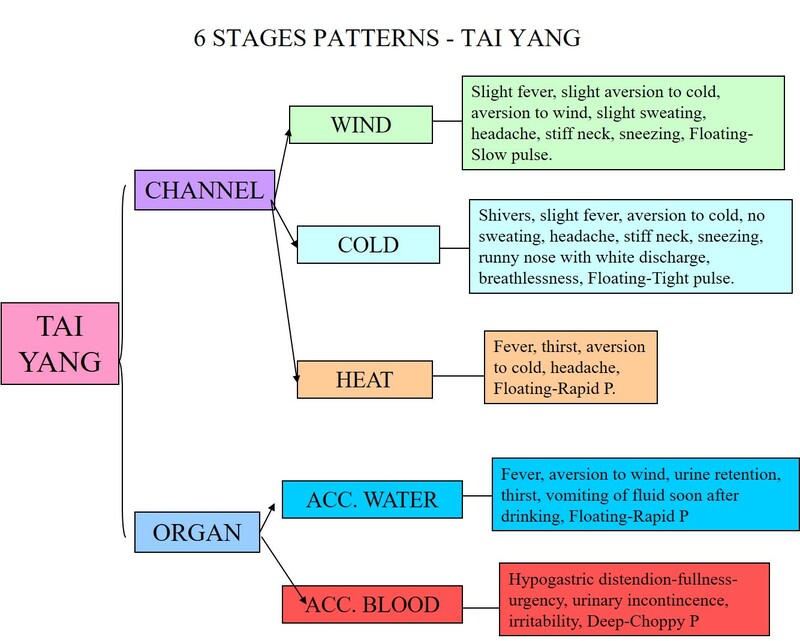 The stronger the external pathogenic factor, the higher the fever (or hot feeling of the body); likewise, the stronger the Zheng Qi, the higher the fever (or hot feeling of the body). 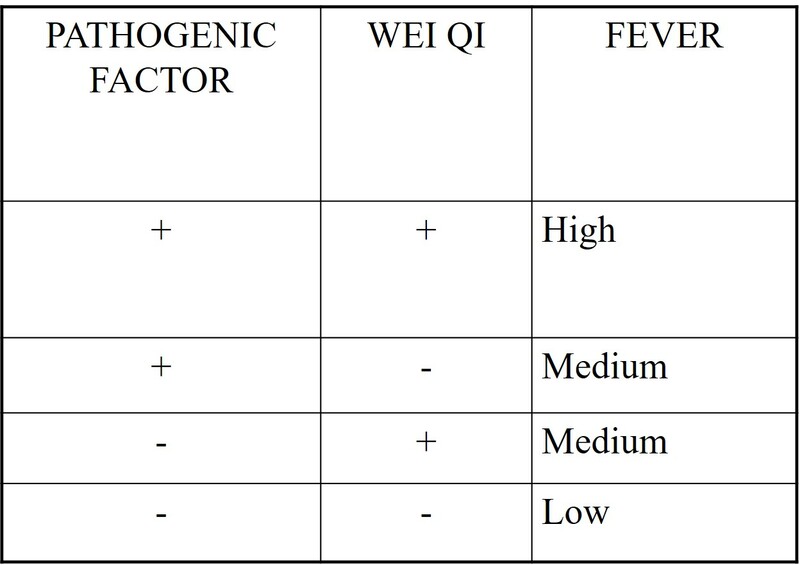 Thus the fever will be highest when both the external pathogenic factor and the Zheng Qi are strong. 3. 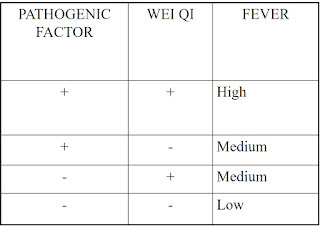 Weak pathogenic factor and weak Zheng Qi: low "fever" (or hot feeling of the body) or no "fever"
However, the relative strength of the pathogenic factor and the Zheng Qi is only one factor which determines the intensity of the fever (or hot feeling of the body). 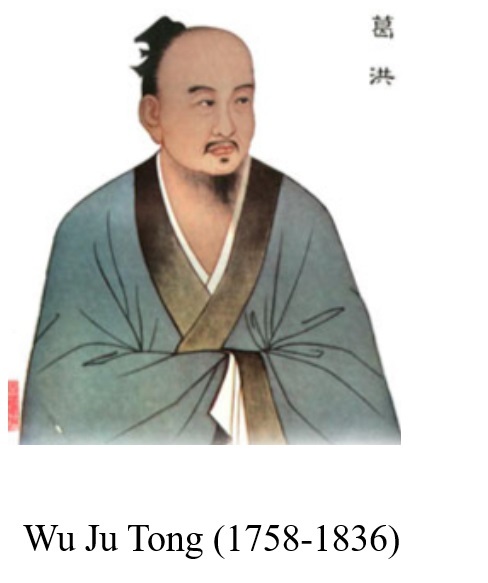 Another factor is simply the constitution of a person: a person with a Yang constitution (i.e. 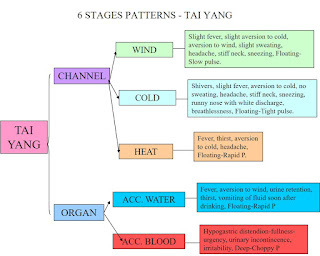 with predominance of Yang) will be more prone to invasions of Wind-Heat rather than Wind-Cold and will be more prone to have a higher fever (or hot feeling of the body). Indeed, it could be said that the constitution of a person is the main factor which determines whether a person who falls prey to an invasion of Wind develops Wind-Cold or Wind-Heat. Were it not so, in cold, Northern countries nobody should fall prey to invasions of Wind-Heat which is not the case. This is also the reason why, in children, invasions of Wind-Heat are far more prevalent than Wind-Cold: this is because children are naturally Yang in nature compared to adults. There are also new, artificial factors which may predispose a person to invasions of Wind-Heat when succumbing to Wind and these are very dry, centrally-heated places, hot working conditions (e.g. cooks, metal workers), etc. 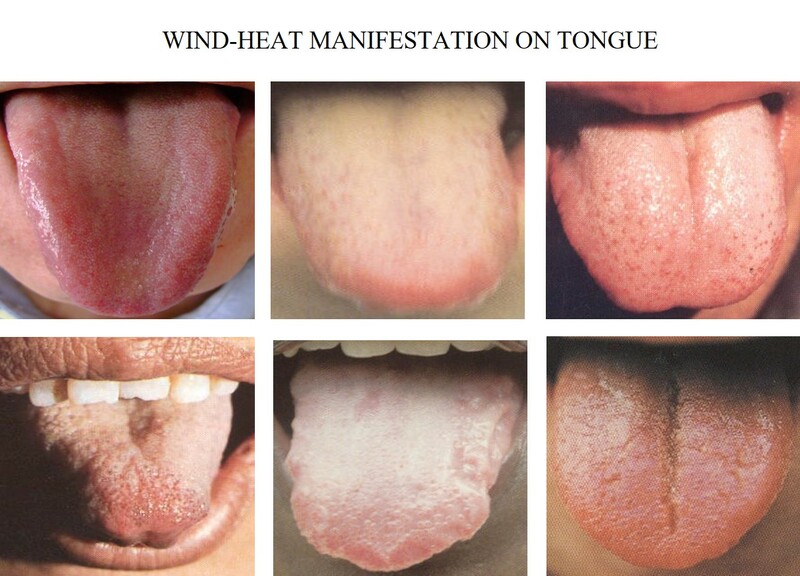 The tongue often does not change in invasions of Wind-Cold but it does change in invasions of Wind-Heat. 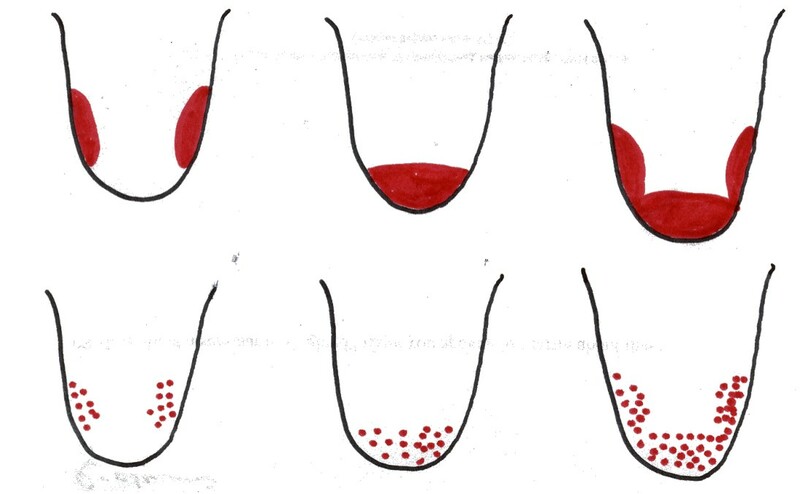 The diagrams below indicate the places on the tongue where it might become red or develop red points in invasions of Wind-Heat. The redder the tongue, the more intense the Wind-Heat. The most important thing to establish when we see a patient suffering from an acute respiratory infection is whether the stage of the condition is external or internal, i.e. whether the pathogenic factor is still on the Exterior or is in the Interior. 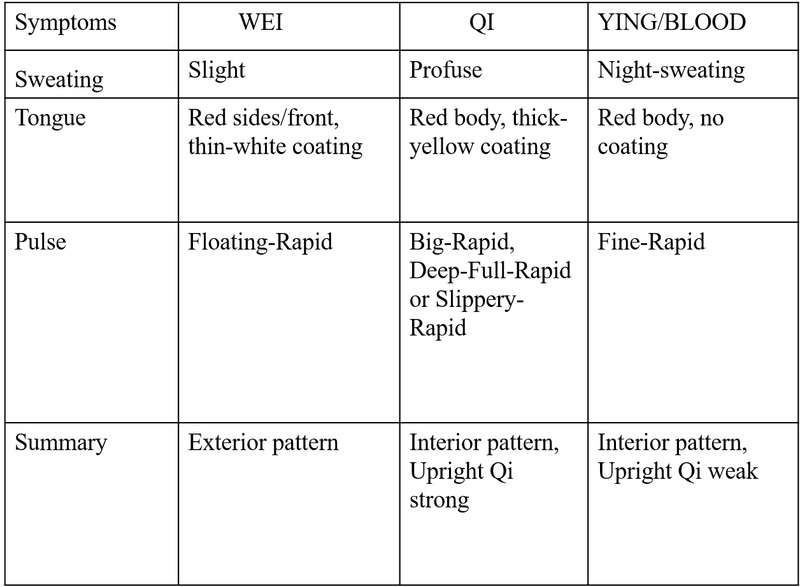 In terms of levels, this means distinguishing whether the patient is still at the Wei level or at the Qi level. 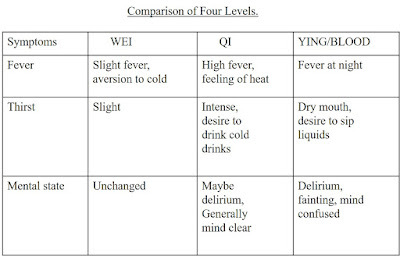 The differentiation between the Wei and the Qi level is relatively easy: if the patient has aversion to cold, he or she is still at the Wei level; if he or she does not suffer from aversion to cold but, on the contrary, from aversion to heat, the patient is at the Qi level. 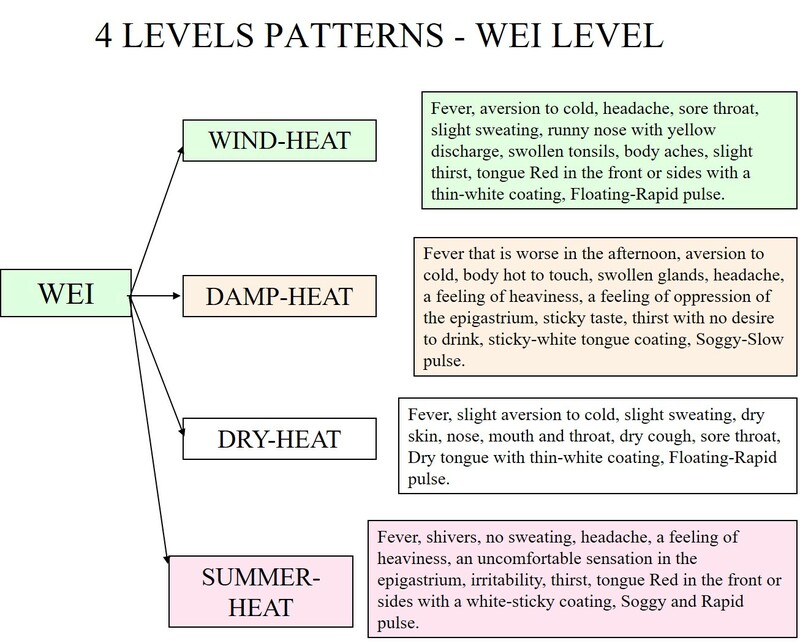 Thus, influenza will always start with manifestations similar to the Wei-Qi level of the 4 Levels. If the pathogenic factor is not expelled at the beginning stages, it will change into Heat and penetrate into the Interior. 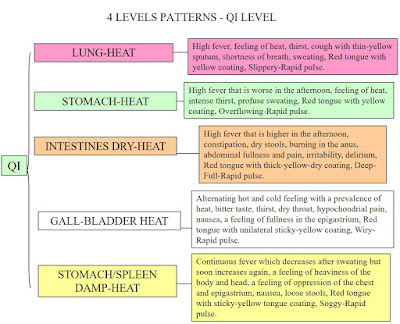 Once the pathogenic factor penetrates into the Interior, the body's Qi carries on its fight against it in the Interior: this causes a high fever and a feeling of heat, in marked contrast to the aversion to cold and the shivering which occur when the body's Qi fights the pathogenic factor on the Exterior. At the exterior level, the internal organs are not affected and it is only the Lung's Wei Qi portion which is involved. When the pathogenic factor becomes interior, the organs are affected and especially the Lungs and/or Stomach (see below). This stage of development in the pathology of these diseases is crucial as, if the pathogenic factor is not cleared, it may either penetrate more deeply and cause serious problems (at the Ying or Blood Level) or give rise to residual Heat which is often the cause of chronic post-viral fatigue syndrome. 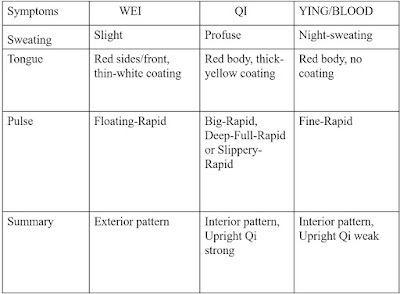 In the Interior, the main patterns appearing will be either the Yang-Ming pattern of the 6 Stages or, more commonly, one of the Qi-Level patterns within the 4 Levels. 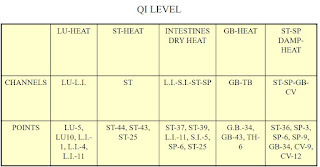 In general, at the Qi Level, either the Stomach or Lung or both are affected. In the patients we see, the Lungs are most commonly affected and the patterns are usually Lung-Heat or Phlegm-Heat in the Lungs. Sometimes, it may be Dry-Heat in the Lungs. 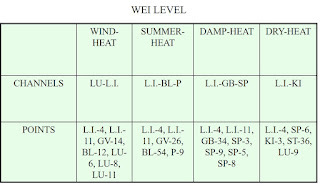 The Wei level is the beginning stage of invasions of Wind-Heat: it is the only exterior level, i.e. characterized by the presence of the exterior Wind on the Exterior of the body. 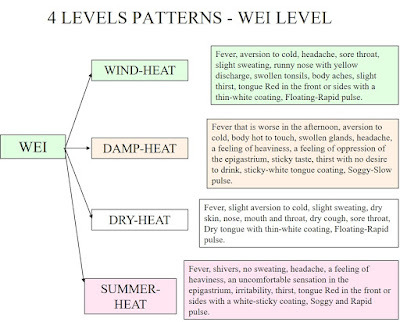 The Wei level comprises of four different patterns according to the nature of the pathogenic factor, i.e. Wind-Heat, Summer-Heat, Damp-Heat and Dry-Heat. Of these four, Wind-Heat is by far the most common one. 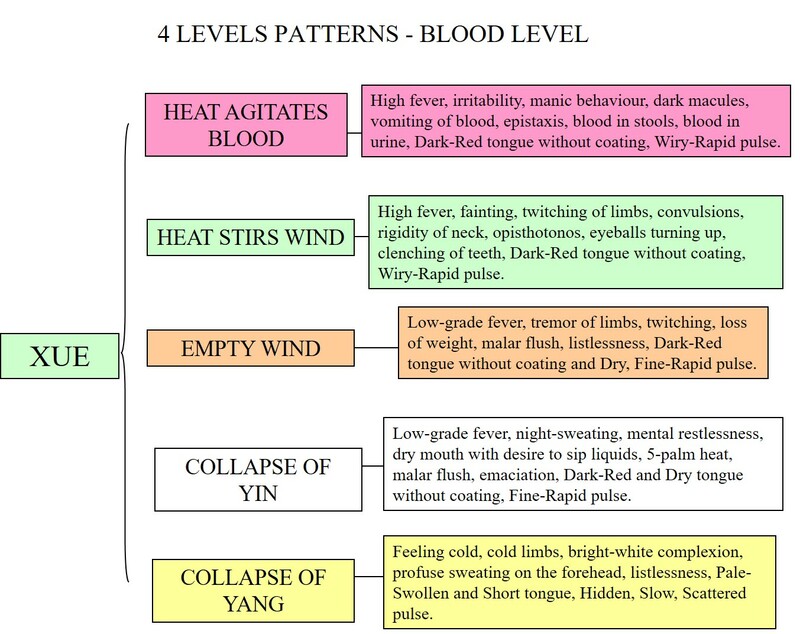 The clinical manifestations of invasion of Wind-Heat at the Wei Level are "fever", aversion to cold, headache, sore throat, slight sweating, runny nose with yellow discharge, swollen tonsils, body aches, slight thirst, tongue Red in the front or sides with a thin-white coating, Floating-Rapid pulse. The pathology of aversion to cold and "fever" has already been discussed. The headache is caused by the obstruction of the channels of the head by exterior Wind in the same way as for the Tai Yang Stage. The body aches, which may be very pronounced, are caused by the obstruction of the muscles by exterior Wind. The tongue coating is white because the pathogenic factor is on the Exterior. A sore throat is due to invasion of the Wind in the Lung channel in the throat: a sore and red throat is a distinctive sign of invasion of Wind-Heat as compared to Wind-Cold. "Fever", aversion to cold, headache, sore throat, slight sweating, runny nose with yellow discharge, swollen tonsils, body aches, slight thirst, tongue Red in the front or sides with a thin-white coating, Floating-Rapid pulse. 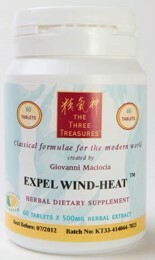 Expel Wind-Heat is for invasions of Wind-Heat at the Wei Level. The dosage is at least 9 tablets a day but if the symptoms are severe, an adult can use up to 12-15 tablets per day. Expel Wind-Heat should be a stand-by remedy in any household with children. LU-7 Lieque, L.I.-4 Hegu, T.B.-5 Waiguan, Du-14 Dazhui, L.I.-11 Quchi, LU-11 Shaoshang (in case of tonsillitis), BL-12 Fengmen with cupping, BL-13 Feishu. If the external Wind is not expelled, it will usually turn into Heat and enter the Interior and most frequently the Lungs. The main symptoms at this stage are aversion to heat, a feeling of heat, possibly fever, cough (which may be dry or productive), slight breathlessness, restlessness, disturbed sleep, thirst, a feeling of oppression of the chest, Red tongue with yellow coating, Deep-Full-Slippery pulse. These are manifestations of the Qi level. Aversion to heat, a feeling of heat, possibly fever, cough (which may be dry or productive), slight breathlessness, restlessness, disturbed sleep, thirst, a feeling of oppression of the chest, Red tongue with yellow coating, Deep-Full-Slippery pulse. Ringing Metal, a variation of Qing Qi Hua Tan Tang Clearing Qi and Resolving Phlegm Decoction can be used for acute chest infections following an invasion of Wind, i.e. when the pathogenic factor is Phlegm-Heat in the Lungs at the Qi level. The main manifestations calling for this remedy in this context are: a cough following a cold or flu, expectoration of profuse sticky-yellow sputum, slight breathlessness, a feeling of oppression of the chest, fever, thirst, disturbed sleep, a Full-Slippery pulse, a red tongue with sticky-yellow coating. Dosage: for adults, take 9-12 tablets a day. Reduce the dosage for children according to age. LU-7 Lieque, LU-10 Yuji, Du-14 Dazhui, L.I.-11 Quchi, LU-5 Chize, BL-13 Feishu, LU-1 Zhongfu, Ren-12 Zhongwan, Ren-9 Shuifen, ST-40 Fenglong. 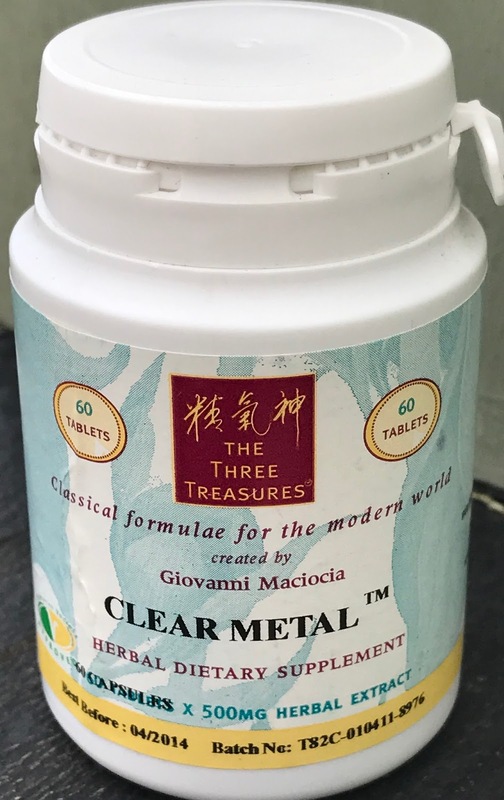 Clear Metal was formulated to treat the Qi Level of influenza but it does treat the Ying level as well. The most common patterns at this level are either Lung-Heat of Lung-Phlegm-Heat so that the patient develops bronchitis or pneumonia. Clear Metal was formulated to treat primarily Lung-Heat at the Qi Level when the patient displays the following symptoms: cough, breathlessness, fever, feeling of heat, thirst, tightness of the chest and upper back, a Red tongue with yellow coating and a Full-Rapid pulse. Clear Metal has also a strong anti-viral action. 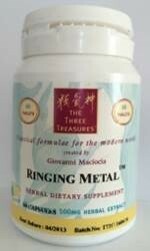 Besides treating the Qi Level primarily, Clear Metal also treats the beginning stages of Ying Level. 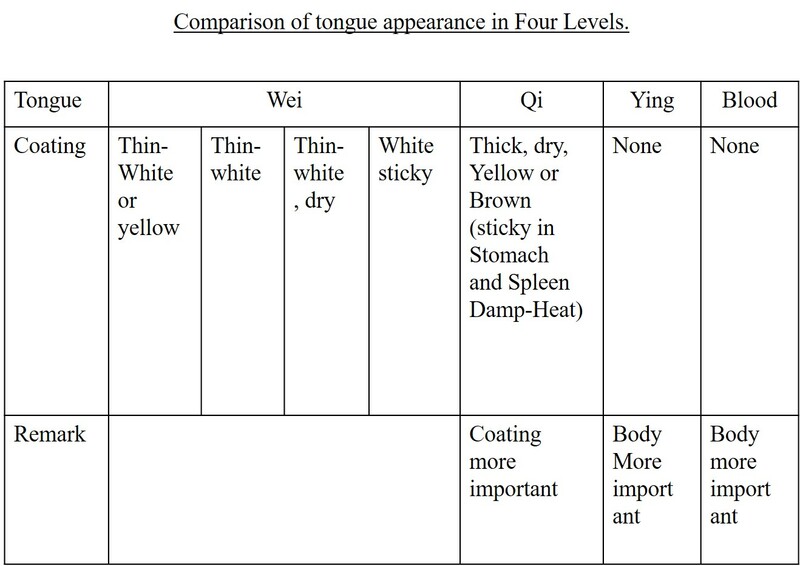 The clearest indication that the Heat is reaching the Ying level is the absence of coating on the tongue. At the first signs of the beginning of influenza (feeling chills, fever, sore throat) take Expel Wind-Heat. If one is in doubt whether the symptoms are those of a "simple" influenza or of those of a more serious type (such as H1N1 influenza), then Expel Wind-Heat and Clear Metal can be taken simultaneously for a couple of days until the clinical manifestations reveal what type of virus it is. If the symptoms persist and progress rapidly to the lower respiratory tract causing high fever, cough, breathlessness, respiratory distress and inspiration crackles, the patient should stop taking Expel Wind-Heat and take only Clear Metal immediately at a higher dose. Please note that this remedy can be administered concurrently with any Western anti-viral medication or antibiotics. The dosage for an adult is at least 9 tablets per day. This dose can be exceeded in severe cases. LU-7 Lieque, LU-10 Yuji, Du-14 Dazhui, L.I.-11 Quchi, LU-5 Chize, BL-13 Feishu, LU-1 Zhongfu. At the Ying Level, the Heat has penetrated to a deeper energetic layer and it has begun to injure the Yin. At this level, Heat is obstructing the Mind and the Pericardium causing delirium and even coma. Fever at night is a distinctive sign of the Ying Level. 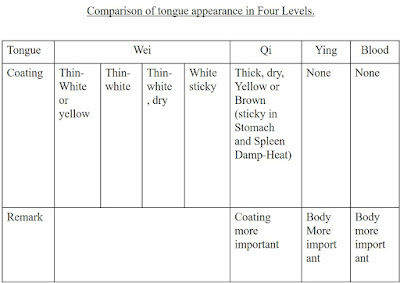 The tongue appearance at the Ying Level is an important sign that differentiates this level from the Qi Level: at the Ying Level, the tongue is Deep-Red without coating (while at the Qi Level, it is Red with a thick coating). 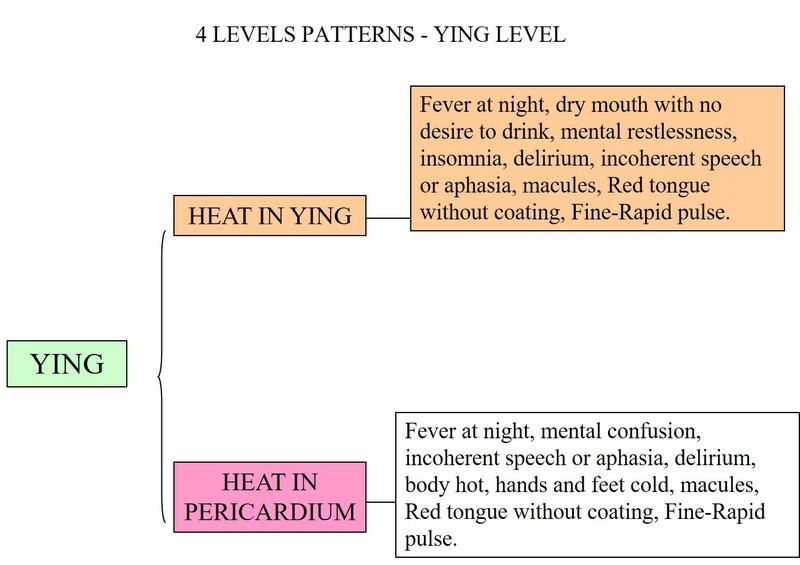 Fever at night, dry mouth with no desire to drink, mental restlessness, mental confusion, insomnia, delirium, incoherent speech or aphasia, body hot, hands and feet cold, macules, Red tongue without coating, Fine-Rapid pulse.Clear Metal may be used for the Ying Level. MACULES are a definite sign that Heat has reached the Blood Level. 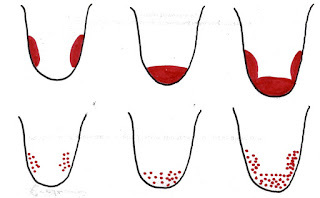 There are five patterns at the Blood Level, i.e. Heat victorious moving Blood, Heat victorious stirring Wind, Empty Wind agitating in the Interior, Collapse of Yin and Collapse of Yang. "Blood" here should be intended as a description of the deepest energetic level of the body. 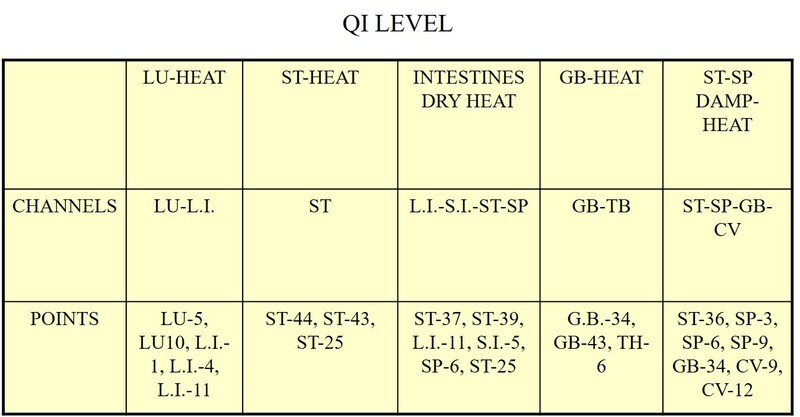 When Heat penetrates this level in the context of a Wen Bing disease, the person may die. The chief sign of invasion of the Blood Level by Heat is bleeding, which may be in the stools, in the vomit and under the skin. Indeed, the presence of maculae under the skin always indicate that the Heat has reached the Blood level and the situation is potentially serious. Heat agitates Blood: High fever, mental restlessness, manic behaviour, dark macules, vomiting of blood, epistaxis, blood in stools, blood in urine, Dark-Red tongue without coating, Wiry-Rapid pulse. 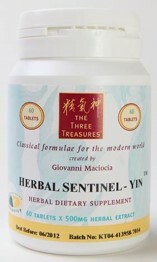 Herbal Sentinel is the remedy to take for prevention. It strengthens immunity and resistance to viruses and bacteria by tonifying Lung- and Kidney-Qi. It is to be taken continuously as long as the swine flu epidemic continues in dosages of 4 tablets a day (for an adult). 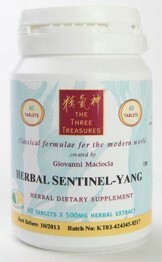 There are two Herbal Sentinel remedies: Herbal Sentinel - Yang and Herbal Sentinel - Yin. The former is for people with a tendency to Yang deficiency (with a Pale tongue); the latter for people with a tendency to Yin deficiency (with a tongue lacking in coating completely or partially). LU-7 Lieque, LU-9 Taiyuan, BL-13 Feishu, Du-12 Shenzhu, Ren-12 Zhongwan, Ren-4 Guanyuan, KI-3 Taixi, BL-23 Shenshu. Key symptoms and signs: acute cough with expectoration of profuse, yellow sputum following an upper respiratory infection, oppression of the chest, thick-sticky-yellow tongue coating, Slippery and possibly Rapid pulse. Key symptoms and signs: acute dry, barking cough, with the occasional expectoration of scanty sputum, chest tightness, Red tongue with yellow coating, Rapid-Full pulse. But this is too broad a category to differentiate. The throat opens on the outside to nose and mouth, on the inside to LU and ST. LU dominates the skin. 1. Wind-Heat penetrating the throat from mouth and nose causing swelling and pain. 2. Wind-Cold invades skin, Ying and Wei lose balance, the P.F. cannot be expelled. It accumulates in the throat causing swelling and pain. · If the tonsils are very big – as big as silk moths it is called - !! Tonsillitis is the most frequently seen throat condition. The pathogenic factor stagnates the clear fluids cannot be transformed they condense into Phlegm. Phlegm-Heat stagnates the tonsils swell and become inflamed (Toxic Heat). Tonsillitis can also be due to ST-Heat “hitchhiked” by Wind-Heat. The tonsils are swollen, red and have either white spots, or white-yellow pus-filled spots on them, which can break and bleed. Other symptoms are: Fever, aversion to cold, headache, weary limbs, aching bones, red-sided tongue, White or Yellow tongue coating, Floating and Rapid pulse. Prescription: Clear the Throat and Benefit the Diaphragm Decoction (see above). 3. Association of Microbiologists (UK) website, 1998.